Interacting particle methods are increasingly used to sample from complex and high-dimensional distributions. These stochastic particle integration techniques can be interpreted as an universal accept . . . . . Contents: THE RULES OF SCIENTIFIC KNOWLEDGE; PRODUCTION AND DISTRIBUTION UNDER CAPITALISM: EMPIRICAL REGULATITIES; STANDARD AND CLASSICAL ECONOMICS; THE FIRST WORLD; THE THIRD WORLD; THE THIRD WORLD W . . . . . Contents: Estimation and Information; Exact Prior Information; Inexact Prior Information; Efficient Estimation of Simultaneous Equation Systems;	The Value of Restrictions;	The Bayesian Approach to . . . . . Contents: Probability; Random Variables, Distribution Functions, and Expectation; Special Parametric Families of Univariate Distributions; Joint and Conditional Distributions, Stochastic Independence, . . . . .
A comprehensive, balanced text, International Trade: Theory and Evidence is the perfect book for International Trade courses at the undergraduate level. It is appropriate either as part of a two-term . . . . . 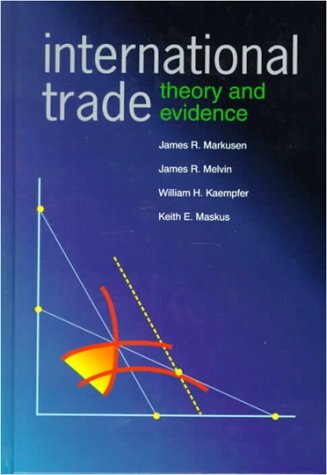 Contents: introduction 1_Theories_of_International_Trade 2_Testing_the_Theories_of_International_Comparative_Advantage 3_Formation_of_the_Trade_Aggregates 4_Data Preview 5_Econometric_Methods 6_ . . . . . Contents: The classical theory of international trade; Basic issues; Analytical tools; Equilibrium and the gains from trade; Factor price equalization; Comparative statics and and welfare; Simple trad . . . . . Contents: Firms and the Decision to Export; Firms and the Decision to Invest Abroad; Intermission: The Boundaries of The Firm; Trade and Organizational Form. Contents:Strategic Form Games; Nonequilibrium Solution Concepts; Nash Equilibrium; Extensive-form Games; Repeated Games; Bayesian Games.